Makati—(PHStocks)—Bank of the Philippine Islands (PSE: BPI) announces the appointments of Ma. Cristina “Ginbee” L. Go as President of BPI Family Savings Bank and Natividad “Nabbie” N. Alejo as Chairman of BPI Direct BanKo Inc., A Savings Bank. Go takes over the post previously held by Alejo at BPI Family Savings Bank, while Alejo replaces BPI President and CEO Cezar P. Consing as Chairman of the Board at BPI Direct BanKo. Effective date of the appointments is June 1, 2017, subject to the confirmation of the Bangko Sentral ng Pilipinas (BSP). Go brings over 16 years of banking experience, 13 of which were with BPI. For 11 years, she was Head of BPI’s Payments and Unsecured Lending Group, after which she became Head of Retail Loans at BPI Family Savings Bank. She has also led initiatives and innovations that have differentiated BPI in the industry, such as leading the launch of the first EMV-compliant credit cards. 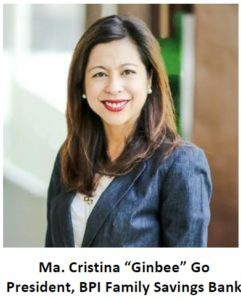 Before joining BPI, Go was Vice President at Citi for two years—working in Manila, she handled the bank’s Retail Bank Marketing for over a year, and in New York, leading the Cross Sell Division for 11 months. In her new role as the President of the country’s premier thrift bank, Go will bring her drive and passion to this very important subsidiary of the bank. Alejo had served as President of BPI Family Savings Bank since 2015, and has had close to 40 years’ banking experience. She joined BPI in 1979 when the bank acquired Commercial Bank & Trust, and has since held various senior management roles in the bank. 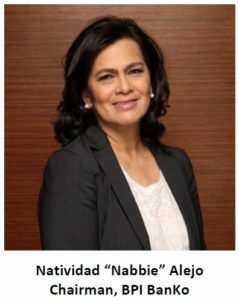 Alejo will provide a solid foundation as she takes leadership of the bank’s growing micro-SME business lending subsidiary, which is now in the process of growing to 100 branches nationwide. At 165 years, BPI is the first bank established in the Philippines and in Southeast Asia. We are licensed as a universal bank by the Bangko Sentral ng Pilipinas to provide a diverse range of financial services: deposit taking and cash management, payments, lending and leasing, asset management, bancassurance, investment banking, securities brokerage, and foreign exchange and capital markets. BPI has significant financial strength, with robust Tier 1 capital adequacy ratios and profitability, underpinned by a stringent compliance and risk management regimes. BPI has investment-grade ratings of BBB- (Fitch), Baa2 (Moodys), and BBB (Capital Intelligence).